Barn Door Handle Inspirations and Ideas ~ oneplustwo design co.
My design decision for the week…choosing a barn door handle. Seems simple enough, right? During our renovation, we’ve hung two new interior barn doors. One in our living room and one in our master bedroom. Choosing the hardware to hang the doors was fairly straightforward, but choosing the door handles is taking considerably more time and effort. (Featured image above of bathroom barn door via Decor Pad). Here is a picture of our living room barn door. It’s fairly contemporary but we want to add a touch of warmth with the right slightly rustic hardware and handle. I love the barn door trend! So must millions of you because there is definitely no shortage of door styles and design ideas out there. 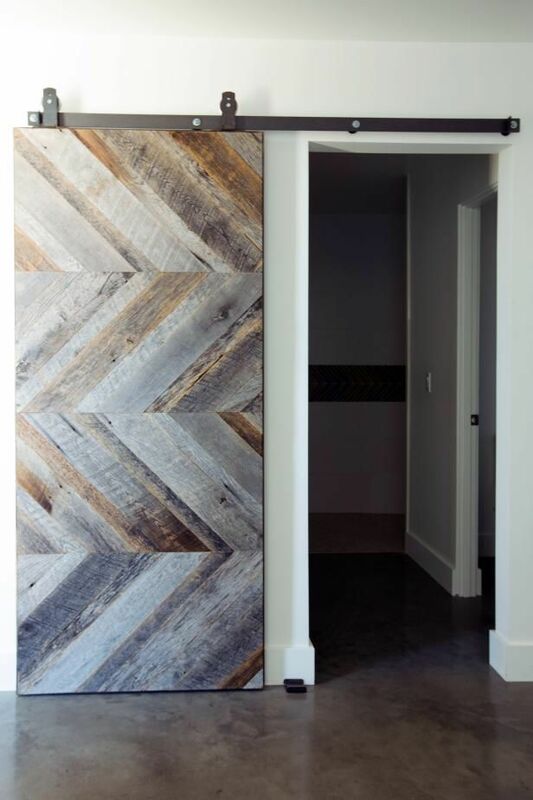 Barn doors are beautiful, functional and completely customizable to your room’s application and personal taste. Made to order or do-it-yourself, the vast inventory of design inspirations means that the possibilities for your room are endless. Find more barn door inspirations from my popular post on barn door styles. Whether you’re redesigning, redecorating or renovating your space, there are no shortage of design decisions to be made. (Click here to see some valuable tips to help keep your renovation on track). No matter what the decision is, however, no matter how big or how small, I say just jump right in. Research the heck out of it! It’s true, sometimes I spend many, many hours searching for some seemingly small, insignificant detail. But their are no insignificant details in design. The details are what pull together to create your final look. Finding just the right solution to your design question makes all the effort worth while. Looking for a barn door handle is definitely one of those endless searches through hundreds of ideas and the countless possibilities. The options are limited really only by your imagination. I’ve seen everything from wrenches to oars, antlers to horseshoes. Seriously, the sky’s the limit. For our barn doors I am looking for something a bit more mainstream than antlers, LOL. As lovely as the photo above is!! I want a barn door handle that is substantial but not bulky. Something with character but not too vintage. A handle that was trendy but had that timeless quality to keep it fresh for years to come. So for anyone else on the barn door handle hunt, here is a mix of contemporary, transitional and modern farmhouse barn door handle inspirations that I have collected. Hopefully sharing them, they can help you on your handle search as well. We are currently torn between two directions. My vote is for something long, square-ish and contemporary, while my hubbies wants something more traditional and gate-like. Let me know which one you like best for our barn door by dropping me a comment below!